Stadthouder of the United Provinces of Holland from 1672 and King of England from 1688. His mother was the eldest daughter of Charles I and his wife, Mary, was the daughter of James II of England. 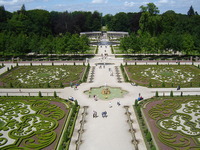 William and Mary made a Dutch Baroque garden at Het Loo in Holland, which was restored in 1984, and a 'Dutch' garden at Hampton Court after 1688. He suffered from asthma and preferred the air at Hampton Court to that at Kensington Palace.